Are you tired of trying to keep your grass in perfect condition? All that watering, weeding, mowing and edging can take up a whole weekend. Maybe you’ve bought a new house and you’re looking at landscaping options? You want grass, but you can’t stop thinking about all the maintenance that goes with it. Well, if that’s the case, you need to think about synthetic lawn. Everlast Services can provide you with the best synthetic grass. It looks genuine, it feels real, and the only difference is you can get rid of your mower, your whipper-snipper, your aerator, your sprinkler system, your weeding tools and everything else you need to keep a living, breathing patch of grass healthy! We offer competitive synthetic grass costs. You can buy synthetic grass from us to lay yourself, or, we offer a synthetic grass installation service. 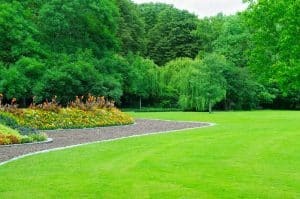 Our landscaping team are extremely experienced in working with this material, and they know how to complete a seamless installation that looks even better than natural turf. We only source from premier synthetic grass suppliers, that offer guarantees and warranties on their product. We go to the extra effort because we want you to enjoy the peace of mind in knowing that your investment will pay off for years down the track. We know you’ll love how your synthetic grass looks, feels and you’ll love the savings you make on water costs and maintenance time. Why Choose Everlast Services for All Your Synthetic Grass Needs? We’ve been involved in the industry for over 20-years, we know what works and what to avoid. We can look at your property and suggest the perfect placement and pass on tips for caring for your synthetic turf to ensure its longevity. We genuinely care about our customers. We’re a family-owned company that has found success by respecting and valuing the people that choose to spend money with us. We show this respect with every project we complete because we know that it’s what got us to where we are today. Our loyalty to local suppliers means we get synthetic grass at great prices. We don’t believe in overcharging, so we make sure that these savings get passed on to you. That way, we get the best materials to work with, and you get to enjoy the best materials at a reasonable price. We offer the full array of landscaping services, as well as first-class concrete, decking and fencing so that you can come to us for all of your landscaping and home improvement projects.